Power JetVac uses a technique called “soft washing” to professionally clean most building exteriors, particularly residential siding (stucco, hardy board, vinyl, cedar, even brick and pre-cast concrete). Less than 100 PSI is used to soft wash a building or a residential. Very little pressure is used, and the surface is actually cleaned by the biodegradable detergents applied, and then rinsed using clean water and a standard water hose. By using lower pressure and biodegradable detergents to soft wash the building, there is much less chance of harming the surface being cleaned or plant, and the results are guaranteed to last much longer than pressure washing. Is a Soft Wash Better Than Regular Pressure Washing? 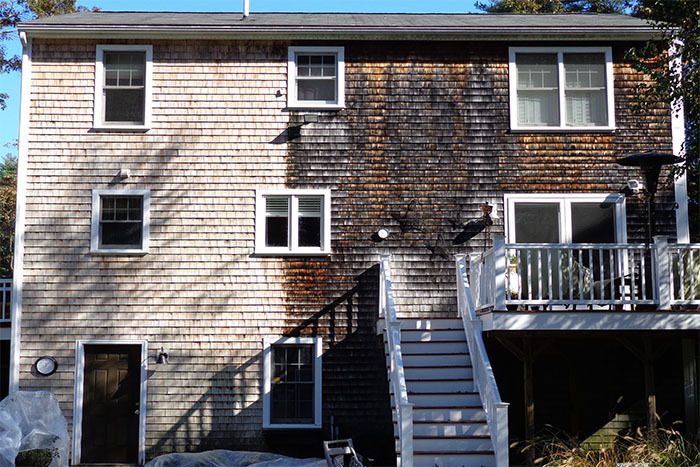 Homeowners eager to get rid of ugly stains on their siding, deck or patio, may worry about damage from pressure washing. That’s where soft washing comes in. The term pressure washing can be a bit of a misnomer. It often brings up myths and confusion about what the service actually entails. Potential clients often associate pressure washing with a stigma. They link it to worn out paint, blown windows seals, destroyed landscaping and/or other possible damage. The only time full pressure (4000 psi) should be used is to pressure wash concrete with a surface cleaner that defuses pressure through two nozzles. Both pressure washing and soft washing are done with a commercial pressure washing machine, which should be used on all jobs. The commercial pressure washer machine will properly distribute and dilute chemicals during pre-rinse, and apply the proper volume/pressure ratio for the appropriate surfaces. This is where the two terms — pressure washing vs. soft washing — are usually confused. In short, both pressure washing and soft washing can be used on your home by a professional pressure washer. A professional power washing company will know exactly what combination and nozzle extensions to use to achieve the proper pressure, volume and chemical mixture to clean all surfaces thoroughly, effectively and safely.